Wow! I was expecting great things from the brand new Freedom Farmers Market...and they delivered! I'd been reading about it for about a month and was already excited about some of the vendors—Riverview Farms, Garnish & Gather, Doux South, and so many more. And there was live music, too! Vendors like the friendly folks at Doux South—makers of some pretty awesome organic pickles!—make a farmers market. You can have the freshest of produce and products, but if the farmers and vendors aren't friendly, you can just forget it. The vendors at Freedom Farmers Market I'm predicting are what's going to keep the market "an astounding success"! Doux South was recently featured in Garden & Gun Magazine, a wonderfully unique publication and one that I've enjoyed immensely since first discovering it. 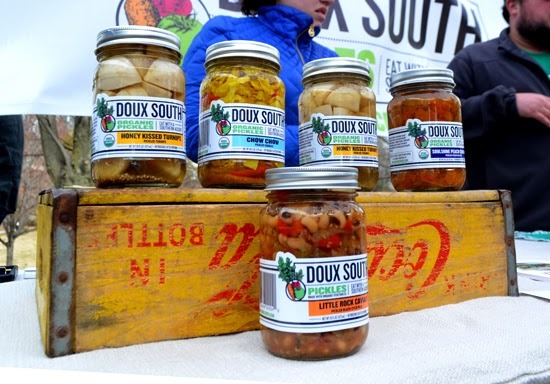 The article on Doux South begins, "Sometimes, a pickle is more than just a pickle." Truth! 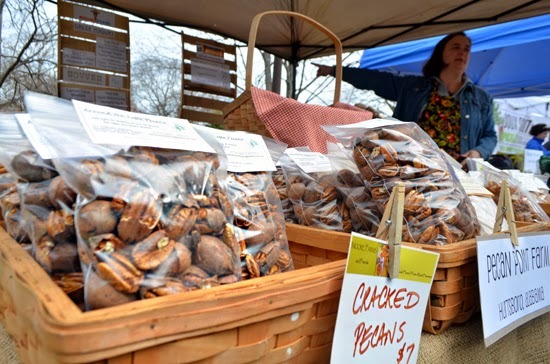 Today, successful farmers markets are so much more than vegetables. BUT...you have to have vegetables and they have to be superb! Farmers market shoppers aren't the granola hippies of yesteryear...to the contrary, we're discerning shoppers. Yes, I visited for insight for my tourist readers, but I personally really enjoy a good farmers market...and I'm thrilled to have found a new one that I really like. The veggies at Freedom Farmers Market are indeed superb. Color me impressed. 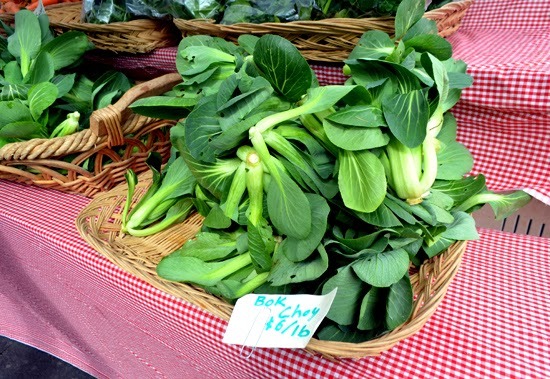 They were fresh, colorful, beautifully presented...the beautiful bok choy above was from Rise 'N Shine Organic Farm. I was so hungry by time I left the market! 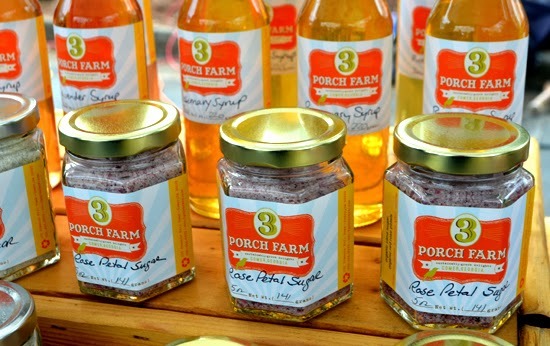 And I discovered some new farms, too, including 3 Porch Farm. The customers who sampled their spice blends were all smiles! And they were featuring their rose petal sugar, rosemary syrup, and lavender syrup, and lots more! Again, super nice people. I also ran into a few people I know...that's always fun. Helping out in the Moore Farms and Friends booth was my friend Tracy Stuckrath, CSEP, CMM, CHC (that's her in the photo above). Tracy is a food allergy expert—incredibly active in that arena—and she was recently appointed to the 2014 Atlanta Foodservice Expo Advisory Council, and an impressive council it is! Tracy's a busy woman! I also got to chat with Anne Quatrano, Executive Chef and Owner of Bacchanalia, as well as several other restaurants. It's always a pleasure to connect with Atlanta's celebrity chefs, especially for a celebrity-spotter like me. It was great to get to chat with the folks at Garnish & Gather, which I've been following for a couple of months on Social Media after a colleague told me about them. 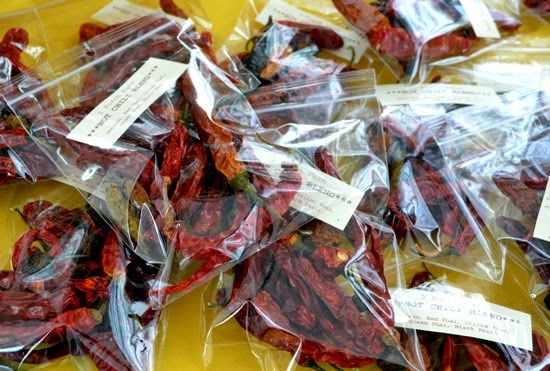 They're partners with a number of local farmers from whom they source. 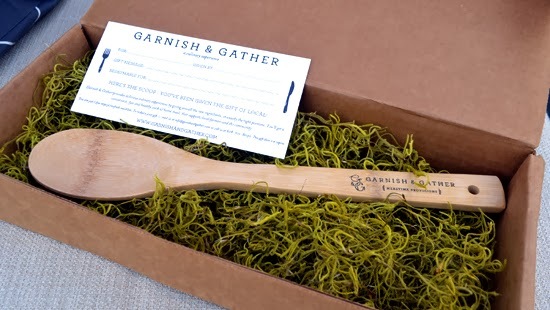 Garnish & Gather delivers full meals—all the fresh ingredients, ready-to-cook, for making a fresh, local, seasonal meal a breeze! Check out their website for details on how to order, the week's meal selections, and check out their blog, too. 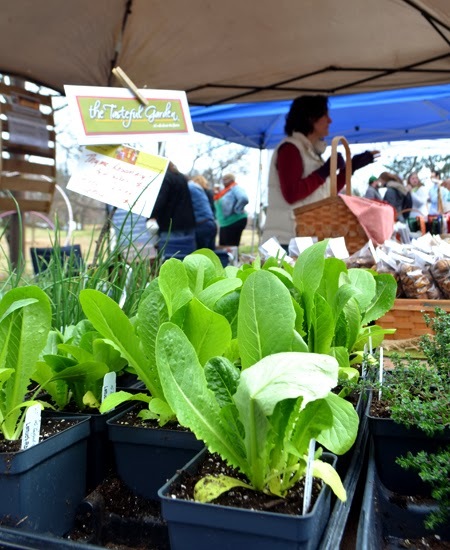 Earlier this week they posted "5 Tips for Shopping at a Farmers Market"...good stuff! If I sound like I'm head over heels for Freedom Farmers Market, it's because I am. What a wonderful experience! Now, I should share that the success of the first week caught a few off guard. If you weren't at the market early, or within the first couple of hours, you may have missed the wares of some of the vendors. I don't think anyone expected more than 3,000 visitors and a few booths ran out of product. But, all of them that I spoke with assured me that they'll be ready next week! I can hardly wait! 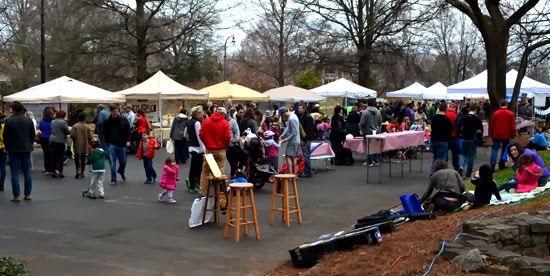 Freedom Farmers Market is centrally located between five major Atlanta neighborhoods and it's on the grounds of The Carter Center. After you've done your shopping, check out the Carter Center Museum—one of Atlanta's best kept secrets! I don't think we have to be concerned with Freedom Farmers Market being a secret, though. Remember your recycled shopping bags, cash is king, and plan to have a great experience! Laurie...what a fantastic booth Moore Farms and Friends has! Looking forward to returning to the Market and shopping with you. Thanks for being part of such a wonderful farmers market...! Lauren...so great to have Big Daddy Biscuits at the Freedom Farmers Market. I was talking with a friend the other day and she specifically noted that one of her favorite parts of visiting a farmers market is getting to see all the cute and sweet doggies. Glad you're there to make them feel special. See you soon! Thanks Travis!!! That just made our day!! You can always get our treats at the Moore Farm and Friends booth when we are not there as a rotating vendor!! We just <3 what we do and making sure the pooches are fed with amazing treats!! !